With a short turnaround between events, and tight freight delivery deadlines, efficient logistics is essential to keep MotoGP™ running smoothly throughout the season. 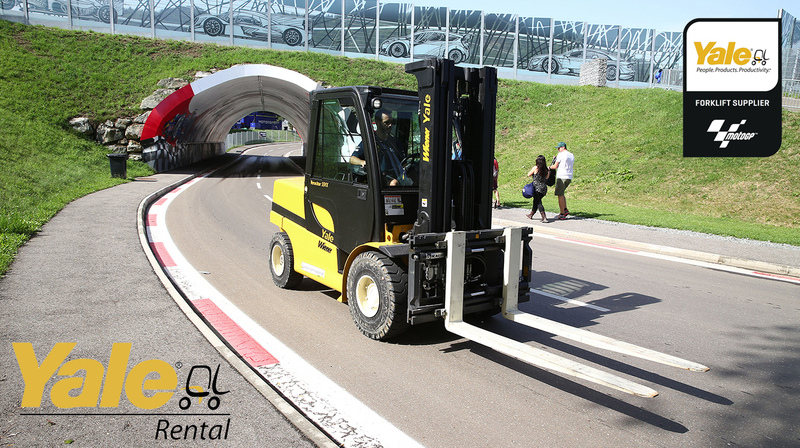 Dorna required a variety of lift trucks with lifting capacities from 2.5 tonnes to 8 tonnes. To meet this demand, Yale CZ provided Dorna with one each of the GDP25LX, GLP35VX, GLP30MX, GDP70VX models and two of the GLP30VX lift trucks. A further GDP35VX truck was supplied by LOG Systems. The tight deadlines and varying demands of the job were a superb showcase for the Yale short-term rental scheme. Thanks to the expertise of the Yale dealers, it was a great start to the Yale-MotoGP™ partnership. This entry was posted in Case Studies, Compact Internal Combustion Trucks, Dealers, Events, Internal Combustion Trucks, MotoGP™, MX, Partnerships, Pride and tagged Brno circuit, Dealers, Dependability, Dorna Sports, Fleet, GDP25LX, GDP70VX, GLP30MX, GLP35VX, LOG Systems, Manoeuvrability, Materials Handling, MotoGP™, Yale, Yale CZ, Yale Europe Materials Handling. Bookmark the permalink.